Ever wanted to make short videos and GIFs and share them with your friends? Well this is your happy day because we have an app for you that can turn your burst photos to short videos and GIFs. Whats the feature lack in Handling System? The system or platform software provided are great but always need some kind filling to make it a complete package. The most loved apps are those that completes the feature set of the handling system. iOS camera app is impressive with burst mode that takes pictures in discerning period and Apple uses its software to take out the best photo from the organization. Albeit, the complete system seemed a little incomplete and thats where Burstio comes to action. This little app scans your photos for detonate print sets and allows us to convert them into short audio-less videos or GIFs with a few steps involved. After you install the burstio app it wil ask permission to grant access to photos which obviously you’ll agree to complete your desired action. 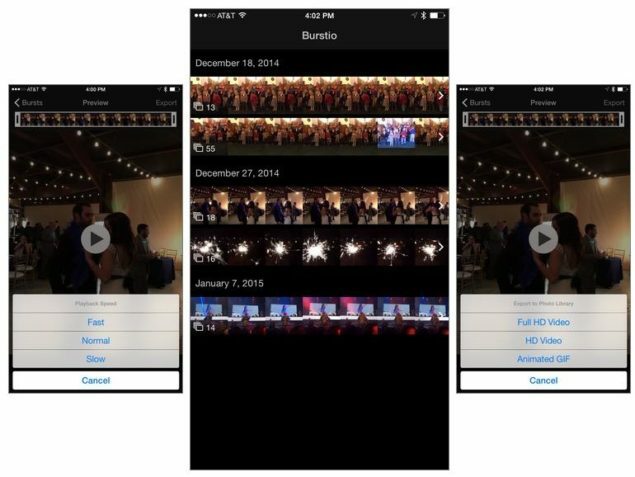 Once the obligate is complete, Burstio will present you with all the burst shots captured in your iOS device. You can alter the video by cutting and trimming and then preview it. You have just created an HD video or a characterized GIF and its all ready to share. its this simple yet very useful. Additionally, we also have an option to set the speed of the GIF plus set it on a replay loop. If the exposure and lights are accurate you can make astounding GIFs and shot HD videos. Burstio is available on the App Store and costs 99 cents, £0.79, and AU$1.29. That is all folks, make sure you leave a comment if you found this app useful and stay put for more handy apps that will ease you in your everyday tasks and tweaks for your device.